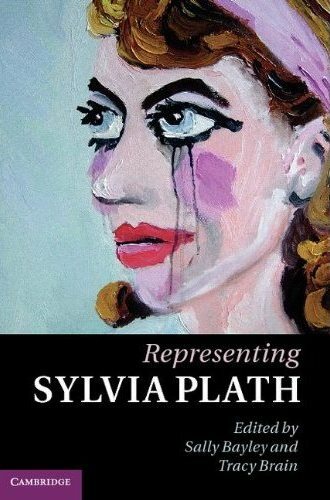 The majority of the eleven essays in Representing Sylvia Plath (249 pages, ISBN: 978-1-107-00675-1, Cambridge University Press, 2011, also available in two digital editions via the publisher: Mobipocket eBook and Adobe eBook Reader) draw from papers given at the Sylvia Plath 75th Year Symposium held at Oxford in 2007. The book is divided into three sections: Contexts, Poetics and Composition, and Representation. The focus of the essays is on the poetry, with somewhat token attention given to Plath's letters and short fiction. Though referenced nine times, The Bell Jar is largely not discussed. 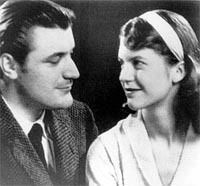 With some exceptions, Representing Sylvia Plath seems to consciously avoid an explicit consideration of Plath's biographical representations - of how Plath directly represents her self/life in her creative works- and this omission is a disservice to a writer who was, according to a close contemporary -Ted Hughes- her own best subject. In his "Introduction" to Johnny Panic and the Bible of Dreams, Hughes writes, "It was only when she gave up that effort to 'get outside' herself, and finally accepted the fact that her painful subjectivity was her real theme, and that the plunge into herself was her only real direction…that she suddenly found herself in full possession of her genius" (5). Hughes also comments in that introduction that even the "arbitrary surreal symbols" of Plath's Ariel poems "are really impassioned reorganizations of relevant fact" (2). In their introduction to the book, Brain and Bayley go to lengths to point out what they perceive as the general unreliability of Plath's speakers through the guises of their veils, specifically seeming to target or caution those that read Plath's works as biographical or factual (note: this is different from a confessional consideration). Bayley and Brain claim the essays add "to a growing movement in Plath studies that is suspicious of an older but still lingering school of Plath criticism that sees her as a 'confessional' writer" (1). But it seems to me that considering Plath as a "confessional" writer has for a long time been out of fashion. So, where and why they bring this up is a mystery. The thesis by which Brain and Bayley base their book and their theme of the unreliability of Plath's texts (her speakers & personas) is from an excised line from a draft of The Bell Jar, "I never told anybody my life story, though, or if I did, I made up a whopper" (1). To base such a thesis upon a "fictional" character while simultaneously issuing a caution against reading any literality into the fictional character (or speakers, in the case of the poems) - and then telling us not to trust how the real person presents herself in her writing - strikes me as odd. (Lest we forget, in the case of The Bell Jar Plath went through a very thorough consideration of potentially libelous content in the novel with her British editor James Michie ... see letter to Michie, 14 November 1961, held at Smith College.) Plath's novel has autobiographical elements; it is based on her biography. So, too, does much of her poetry and her short fiction. To deny this is simply stubborn. But then it is important to remember that certain academics need to try to make things complicated... The creative genius of Plath is how she wrote about herself in the selected mediums she did, and how she mythologized that self and connected it up "to the larger things, the bigger things such as Hiroshima and Dachau and so on" (Orr). How she took those real life physical and emotional experiences, such as attending a bee meeting which she captured in her Journals, and turned them into art is fascinating. The gestation period between event and composition in this case June to October 1962 (excluding the false start of "Stings" in August which goes to show that the transformation was not yet complete) is a topic that would add richly to how Plath represented herself. To further belabor my the point, to disdain of ye olde confessional (or biographical) reading of Plath and then turn around and edit a book which explores "Plath's own self-presentations" (how she presents herself) is strongly hypocritical. Two highlights in Representing Sylvia Plath are Kathleen Connor's "Madonna (of the Refrigerator): Mapping Sylvia Plath's Double in 'The Babysitters' Drafts" and Luke Ferretter's "'Procrustean Identity': Sylvia Plath's Women's Magazine Fiction." Connors essay uses Plath’s journals, journalism, and biography to effectively illustrate an instance where Plath represents herself creative in the form a poem. It is the crowning achievement in the book and as it accepts Plath's biography as a focal point of inspiration of the poem discussed, it should not come as a surprise as to why I liked it so much. The information contained in Ferretter's paper was so fresh when first given in October 2007 at the Plath Symposium, before his full length critical study on the subject of Plath's fiction was published in 2010 (read my review). People who have read that book and then read this essay might feel that they have somehow gone backwards. Nevertheless, it is a brilliant essay. It is worthwhile, too, to point out that Ferretter's paper might have worked better in the Contexts section given the richness of background material at the start of the essay. These two essays make wonderful use of Plath's archives, showing important perspectives in the creative process. Essays by Jonathan Ellis (Plath's letters), Sally Bayley (tree imagery), and especially Anita Helle (use of photographs), have moments of revelation and excellence. The rest of this review will focus on the last part of the book, Representation. This section will interest primarily those interested in what happens to Plath in the minds of others (writers, artists, etc. - even certain biographers) and is a by-product of how Plath inspires and how one interprets her; and thus "represents" Sylvia Plath in a very literal, surrogate format. Lynda K. Bundtzen's essay the exception - and her essay is certainly the best essay of the three in this section - it is not particularly an area of Plath studies in which I am interested. In fact, the last two chapters of Representing Sylvia Plath step away from a direct study of Plath's works and the discussion leads away from something which Plath produced to something produced in reaction to something Plath produced. I largely fail to see how this improves either our (or my) understanding of Sylvia Plath or how it contributes to the scholarship, and this lets the book down. Which is a shame, as I typically read eagerly anything by both Brain and Bayley. Conversely, I do find that I have similar opinions to much of what Brain discusses in her piece. As anyone who either attended the Plath Symposium in Oxford or read about it in one of my daily reviews of event knows, the title of the book comes from Tracy Brain's own paper delivered on 28 October 2007 (and given again on at least one occasion, 20 November 2007 in London). This presents a crucial, critical conflict to my reading of this book because what Brain does in her essay (renamed to "Fictionalising Sylvia Plath") is wholly different to what the other contributors do. The same goes for the regrettable Chapter 11... So my expectation in a book by this current name automatically refers back to the circumstances in which the topic was first introduced: a discussion of the fictional representations of Sylvia Plath. (It should be noted that another paper given at Oxford, and published in early 2009, also discusses biofictive representations of Plath. See Annika J. Hagstrom's "Stasis in Darkness: Sylvia Plath as a Fictive Character" in English Studies 90, 2009.) This is my own hurdle to get over but it is not coming easily. I agree with P.H. Davies that Brain's essay could be the subject of its own volume. This would enable a couple of things: she could attempt to answer the myriad moralistic, rhetorical questions she poses as well as discuss what I see as a large gap in her essay, which is a failure to consider as fully as she does the fiction, the poetry inspired by Plath. Most of the poetry inspired by Plath is lamentable, but there are a couple of people that do it well: namely, David Trinidad and Christine Walde. Likewise, in the last chapter, a failure to recognize a wider pool of artists who respond to and "represent" Sylvia Plath is a narrow shortcoming, particularly as it ignores the complicated brilliance and originality of the artwork of Kristina Zimbakova, whose artwork was prominently displayed and widely admired at the Oxford Symposium. Simply put, the last chapter feels like a Mean Girls-esque insider’s club, six-degrees of separation clique. Say what you will, but an essay on interpretive dance with image stills of that dance does not translate well in to print. Perhaps a DVD should have been included that contained visual access to all the work discussed in Chapter 11? Throughout the book there are a number of instances where a full familiarity of artwork discussed by Plath's and others will require the reader to also have with them either Eye Rhymes or a time machine. Nervaux-Gavoty's essay makes little sense without Eye Rhymes, especially when she refers to works still not published and that would require a visit to the Lilly Library to see. This is simply unfair to most readers; and to boot the art discussed is not detailed in a sufficient way to help the reader "see" the work considered. Bayley refers to Vine's "sylvia robin" which was destroyed by the artist after it was displayed in London. The description of this piece, with a red bird perched near the Plath figure as "as visual equivalent of a Hallmark card taken to its most grotesque conclusion," confirms that we are indeed not missing anything (229). Credit to Vine then for sparing us. A DVD -or more illustrations at the least- would have given the reader something to refer to; as it stands for this and a host of other reasons the last chapter should be disregarded. For editors who have been critical over how Plath's own works have been edited, I expected more from a work that they edited. Some oversights that are more annoying than the rest are: the recording Plath made on 30 October was not done for the BBC, but for the British Council and the Woodberry Poetry Room. Plath did record "Berck-Plage" for the BBC on 29 October; however, the session and interview with Peter Orr the following day was unrelated to the BBC. These poems may have aired on the BBC, but that is not the same thing. It is Wober, not Weber (pages 37 & 52). Also, there are several nearly shameful instances of sloppy editing in the dating of poems in Chapter 11. There are many more but I am trying to be less picky. If the editors/authors would like a list of things to be corrected in future printings of the book I would be happy to supply one. At $85 (cheaper in digital edition formats) one would expect full color illustrations throughout, not just the cheap boldness of a shocking and colorful cover to try to draw you in. The illustrations in the final chapter could have made a much greater impact in color. For example, full color would have enabled the inclusion of Figure 8 "Color script" (page 210) from The Girl Who Would Be God to be less pointless and more affecting. They are not, but the essays in this book feel disparate: though nearly all of them individually shine, these are not essays written intentionally for a book on the theme of "Representing Sylvia Plath" and as such they fail to be purposeful and cohesive in the way that essays in Eye Rhymes or The Unraveling Archive are. As many of the essays were originally conceived and/or presented in 2007 or earlier, they may not be therefore considered as "new developments" in scholarship on Sylvia Plath (1). To quote from Ferretter's essay (who in turn was quoting a rejection letter Plath received), the book is missing an "indefinable something" (156). Thus, this is a good though uneven book; and not worth the heavy price which will alienate the majority of Plath's readers. To close, the cover art for the book is atrocious. Honestly: blue eyes? If one were to judge a book by its cover one would not pick this book up. Though unacknowledged in the text dealing with Vine in Chapter 11, the cover image is of course a (heinous) "representation" of Plath's 1956 photograph with Ted Hughes. Stella Vine's representations of Sylvia Plath are unoriginal, misguided, dreary, and quite damaging to Plath's still somewhat fragile image in popular culture, and in this regard I am referring to the disgusting casual ease with which people tend either to mock Plath's suicide or feel that the suicide in some way defines everything about her. It is hardly the view of Plath which many of us are fighting to adjust and has been more prevalent in recent years when one considers Plath's own writing, what Karen Kukil calls Plath's "zest for life." The image looks like the exaggerated teenage offspring which was the result of a confounding three-way between Dorian Gray's haggard portrait, the Joker and Amy Winehouse. 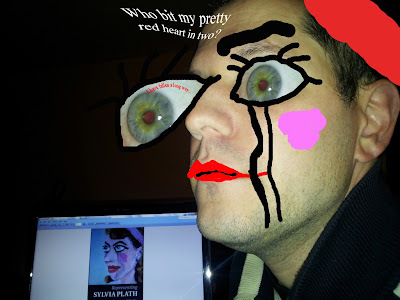 It is crass and represents not Sylvia Plath, but bad art and poor taste. At the request of some of the comments from my review of Janet Badia's book and from personal emails received ... Represent THIS! The Mayor Gallery has posted their installation photographs from the Sylvia Plath exhibit, which closes in just under a months time. Before we look at Plath at the Boston Book Fair, I have recently learned that several limited edition books of Plath's published by the Rainbow Press are for sale through the Mayor Gallery in London. These books are being sold by both Frieda Hughes and her aunt, Olwyn Hughes. It appears that there is almost a complete liquidation of Plath by her daughter. That appalling thought notwithstanding, I have seen these books in libraries and they are nice books and the second two, Dialogue Over a Ouija Board and Lyonnesse, at that price point, are quite reasonable given their rarity. Lyonnesse is particularly nice as the endpapers contain a facsimile of Plath's poem "Lyonnesse," though under its original title "Amnesiac: The Man With Amnesia." There is a reproduction of the 'Study of a Figurine' in this book. Should anyone be interested in buying me a copy of the above please let me know and I'll give you my shipping address! 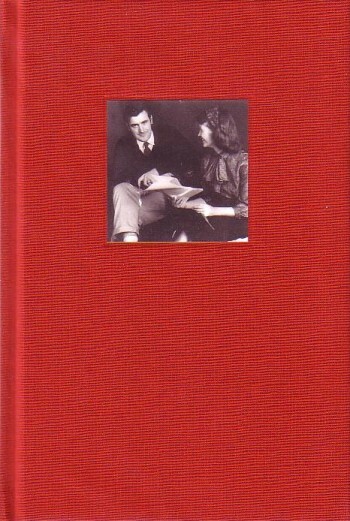 If you are interested in Plath's posthumous limited edition publications, I have collected images from booksellers and private collectors and have them on this page of my website for Sylvia Plath. Overall there was less of a bibliographic presence for Plath at this years Boston International Antiquarian Book Fair. But, even still there were really some beautiful Plath books on show and overall, some stunning other volumes as well. The first thing you saw when you walked in the door this year was the booth of James S. Jaffe. And, prominently displayed is his recently reduced price first Heinemann edition of The Colossus which Plath signed for Theodore Roethke. Years ago the book was priced at $50,000; then it rose to $65,000, but now it is back down to its more reasonable $50,000 price tag. The next booth I stopped in at was Between the Covers from New Jersey. They had on hand beautiful first editions of Ariel (Harper, $475) and Crossing the Water (Faber, $450). Additionally, they had their recent acquisition of Plath’s copy of Edna St. Vincent Millay's The King’s Henchman ($10,000). The book includes a book plate with Plath's signature, as well as an inscription from Plath’s mother. Connected to Between’s booth was Ken Lopez who had the drawing Plath did of a teenage friend. Caliban Book Shop of Pittsburgh had a decent edition of Bumblebees and Their Ways by Plath's father for $250. I have seen the dust wrapper before, but only online. In person it is really attractive. A nice book dealer, Paul Foster of London, had three Plath books: A Day in June, The Green Rock, and a rebound Ariel (in fine leather binding). The fine leather bindings bother me; I think it means a first edition of the book was found in a crumby dust wrapper, or lacking a dust wrapper, or with damage to the original boards so they rebind it and thus are still able to charge a lot for it, in this instance £500. I understand I think why book sellers do this but I do not like it. Royal Books of Baltimore had a first Knopf edition of The Colossus for $950 (I've seen nicer, for less). Athena Rare Books from Connecticut had four Plath books on hand, each stunning and lovely. They had first Faber editions of Ariel ($1200), Crossing the Water ($400), and Winter Trees ($250). Additionally, they have a copy (#8) of The Magic Mirror ($750). The pièce de résistance is Jonkers Rare Books $11,000 copy of the first Heinemann Victoria Lucas The Bell Jar. In a nearly perfect, exquisite dust wrapper, the book looks as fresh as it must have when it was printed in later 1962 or early 1963. Whilst I have not the means, someone out there is buying Plath as a few books I had seen in years before were no longer there. Dealers are pretty open that things have sold. So, I am happy for the person who is or the people who are buying these books. Jonkers had a delicious copy of Ariel: Sold. (They actually had two and they both sold) B & B had a lovely Heinemann Colossus with a review slip: Sold. In fact, there used to be more than a dozen copies of the Heinemann Colossus and the Heinemann Bell Jar listed on abebooks.com and now there are far fewer. I did leave with a purchase though from our good friend in poetry, Jett Whitehead. A first edition, third printing of Ted Hughes' The Hawk in the Rain (Harper & Row). Set me back only three and a half Hamilton's. I have long wanted this in hardback for a few of the poems that I like, as well as for the dedication "To Sylvia." All in all a great fair as usual. Any time one can walk around and talk with book dealers, get a little education on the books & the trade, hold precious volumes (a copy of The Great Gatsby for $192,000) is a good time. Speaking of The Great Gatsby... Although, I have linked to this before (13 August 2010 and 22 August 2007), you can read "A Description" by Park Bucker of Plath's copy of Great Gatsby, which is held by the University of South Carolina and joins other Fitzgerldiana as part of the The Matthew J. and Arlyn Bruccoli Collection of F. Scott Fitzgerald. The following images of the Sylvia Plath exhibit on at the Mayor Gallery were sent to me from Sarsaparilla Esperanza Gomez. Thank you Ms. Gomez. The pictures are shown in the L-shaped part at the back of the gallery and are displayed quite crowded with little space between them. Reminds me of Plath's description of her father's headstone in her Journals, "headstones together, as if the dead were sleeping head to head in a poorhouse." You can get an idea of the frames from the photos: thin mahogony ones. I am aware that the gallery itself had installation photographs taken last week, so we can expect to see more of what the exhibit looks like then. Earlier this year we were pleased with a Plath doodle. Then came the exhibit in London at the Mayor Gallery of "Sylvia Plath: Her Drawings". 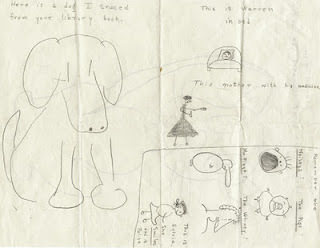 This led me to "the Google" and I found the following drawing made by a very young Plath. This comes from an article called "Some Relics of Childhood" by Rodney Phillips, which appeared in issue 9 of Cabinet Magazine and was published in Winter 2002/3. The book Plath traced the cat and the dog from, Manners Can Be Fun, sounds like a great read and one that certainly could help me in life (though I'm not sure the book advocated eating all of Dido Merwin’s food in France in 1961 but we can hardly blame Plath for that). The dog, too, came from this book. I found a cover online of a revised edition (1958), which features a very similar looking dog in the bottom left. For those that don't or won't see the interest in this kind of thing, remember that Plath's learning to trace drawings can be correlated to her apprenticeship in writing as she imitated writers she admired (Stevens, Auden, Thomas, etc.). And, there is one more article to pass on to you today on the Plath exhibit in London. It is by Ann Binlot, appeared on 9 November on Artinfo.com and is titled "New London Drawings Show Reveals Sylvia Plath's Lesser-Known Lines." This weekend (11-13 November 2011) is the 35th Boston International Antiquarian Book Fair to be held as usual at the Hynes Convention Center. As usual I will walk around and obsess and drool over all things Plath and report back back books, prices and what not. Hopefully will score some photographs, too, to share with you. Read about the fair in 2010 here. And I did two posts in 2008: the first and the second... 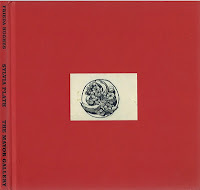 The blog over at the valuable Fine Books & Collections also has a preview and Plath made the list of neat items to see. Unrelated to the Boston Book Fair...US readers will finally have a new Kindle option of a Sylvia Plath book. The Colossus will be released in Kindle format on 23 November. Let’s hope this is the first step is allowing electronic access to Plath’s works to this market. The book will be published via Random House Digital, Inc.
Again, if you are interested in helping to make Plath's books available through Kindle, you can have your say. Please read the last bit of this post from January. 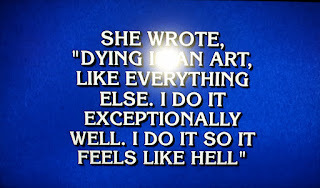 Sylvia Plath was the $800 answer today on Jeopardy's category "Verse Case Scenario". The best part is, the guy that got it right's first name was Buddy! Sorry about the flash glare. 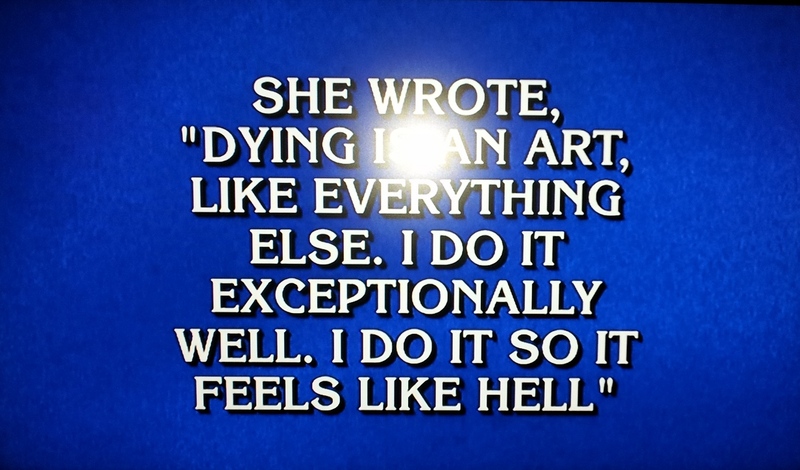 For those concerned, the line is "Dying is an art..." This is Plath's second recent appearance on Jeopardy. Two new reviews to mention today on the exhibit of "Sylvia Plath: Her Drawings." Sam Leith at The Observer reviews quite favorably the exhibit in "These drawings give us a whole new Sylvia Plath – sprightly, witty and fun" which appeared on 6 November 2011. Sylvia Plath: Her Drawings. (London: The Mayor Gallery, 2011), 63 pages. ISBN: 978-0-9558367-8-7. Illustrated. Hardcover, no dust wrapper, as issued. The catalogue for the exhibit of "Sylvia Plath: Her Drawings" is a gem. The bold red cover is of a quintessential Plathian nature, and is reminiscent of the exhibition catalogue for Karen V. Kukil and Stephen Enniss' "No Other Appetite": Sylvia Plath, Ted Hughes, and the Blood Jet of Poetry (Grolier Club, 2005). Published in a limited edition to 1,000 copies, the full color scans throughout are bound to delight Plath's readers (scholars, fans: we are all in this together). Or a piece of my hair or my clothes." Although the plates within the catalogue are divided into sections (Drawings from England, Drawings from France, Drawings from Spain, Drawings from the U.S.A.), this is not rendered in the books table of contents. Rather, the list of plates are just that, a list, which is difficult to read. This mash-up of titles was likely done to conserve space, but in an exhibition catalogue of artwork, the design and aesthetics of the book layout should trump cheapness every once in awhile. Add the extra page, charge an extra quid. The book concludes with a brief biography (really a timeline, date of Plath & Hughes' wedding is incorrect) and an even more brief bibliography of works by Plath. The font & formatting throughout looks inconsistent and as a result is somewhat distracting. The pagination ends on page 59 with the last plate, though the text carries on for four more pages through page 63. Weirdly, the table of contents lists the plates as going to page 55, though they in fact go through page 59. The drawing of Ted Hughes, withdrawn from the sale according to Michael Glover (Independent review, 4 November 2011), does not appear in the catalogue though it was featured at least twice: in Frieda Hughes' article "Lines of Beauty," and the article by Beth Roberts ("Sylvia Plath Drawings at the Mayor Gallery," The Telegraph, 25 October 2011), so that a full overview of the exhibit as it was originally planned can be seen. All that taken into consideration & most likely disregarded, one will and should buy this book for the illustrations and the illustrations only. At only £10 (with shipping to America will run you about $26), I would have paid double. As the drawings were for sale and nearly all have been sold at this point in time, the catalogue will be the only enduring way in which these creations by Plath can be seen as a whole. As these were not available through the archives that contributed largely to the book Eye Rhymes (ed. Connors and Bayley, 2007, and sadly now out of print), the drawings by Sylvia Plath in the catalogue add a richer dimension to our understanding of Sylvia Plath as Artist. At a disadvantage having not seen the exhibit in person (if someone would like to buy me a round-trip to London, please email me), the catalogue is a successful surrogate, and I highly recommend buying a copy, or two. Michael Glover at The Independent coolly reviews the exhibition "Sylvia Plath: Her Drawings" which is now on at the Mayor Gallery in London. The subtitle to the review, "Plath the tortured poet's pictures are too polite to be a big draw" says all you'll need to read... But he just does not get it. Or, at least he does not get Plath. Glover asks, "What we really want to know about this exhibition is this: how does it connect with the rest of her tragic life? Are these drawings pent, febrile and tortured in the way that many of the greatest of the poems are pent, febrile and tortured? Have the things that she is drawing – flowers, animals, bottles, trees – been turned into terrible symbols of themselves?" These images all could have easily fit into her drawings (a kettle actually did)... I ask Glover, Why do we want to focus on the tragedy of her life? What does that accomplish? This exhibit is an appreciation of her life & some of the things she created: something into which she put, temporarily, all of her heart and soul and concentration. Call me Captain Obvious, but Sylvia Plath's death was tragic. Not her life. 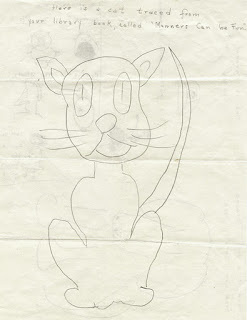 The Mayor Gallery exhibit of "Sylvia Plath's Drawings" opens today at their space at 22A Cork Street in London. Containing 44 drawings, this is the first British exhibition of Plath's artwork. In the "Current" section of their website, it is possible to view all 44 drawings. Bravo! In 2002 at the Sylvia Plath 70th Year Symposium held at Indiana University, many of Plath's creations were exhibited from the collections of both Smith College and Indiana University. 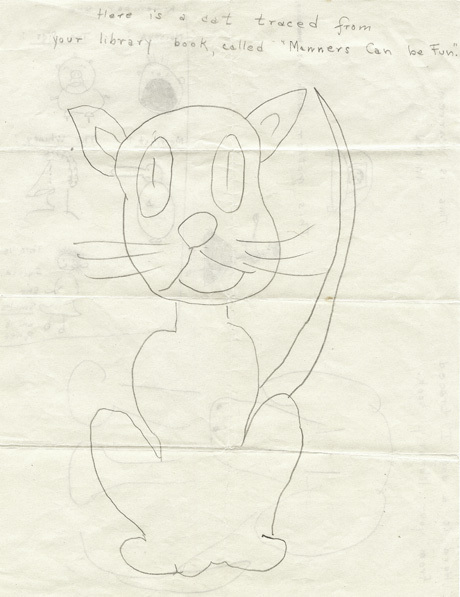 Yesterday, Matilda Battersby of the Indpendent wrote "Unseen Sylvia Plath Drawings Go on Show." The page containing the article has been loading painfully slowly, so your patience is I'm sure appreciated. 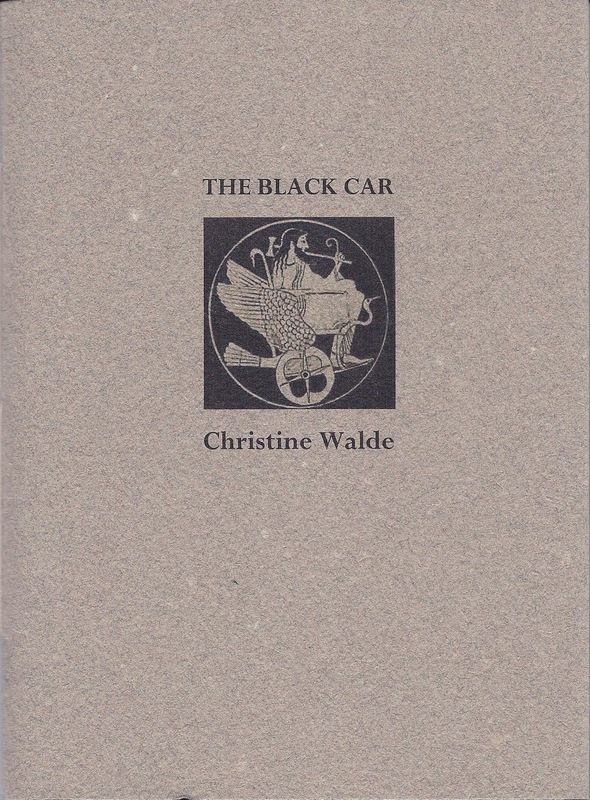 Recently published by Baseline Press, The Black Car by Christine Walde features poems inspired by Sylvia Plath. In these poems we join Walde on an journey into Plath's brief sojourn to Canada in the summer of 1959. Subtitled Reflections on Lethe, The Black Car also finds its poetry sourced from H.D., Charles Baudelaire, and Edna St. Vincent Millay. The poems are completely original and in Walde's own unmistakable voice. In the "Afterword," we learn a bit about the books genesis; the prose and the story are inspiring. Exquisitely produced in a limited edition that is sure not to last, The Black Car is a book worth owning and cherishing. 36 pp., ISBN 978-0-9869570-1-7, $10. The cover is of St. Armand Canal, and the flyleaf of Tibetan Cloud. The book is available for on-line purchase through the link above. Christine Walde (London, Ontario) is the author of the novel, The Candy Darlings (Penguin Canada and Houghton Mifflin). A second novel, Burning Down Tiger Mountain, is forthcoming. Her writing has appeared in publications such as Vallum, Carousel, Plath Profiles, Descant, Quill and Quire, and The Globe and Mail. Her Plath Profiles poems appear in volume 2 (Two Poems), volume 3 (Three Poems), and volume 4 (Mr. & Mrs. Hughes, Camping). You can read more about The Black Car here.